LynchyRightNow: Wasn't this supposed to be easier? The defending champion Celtics and the perennial champion Spurs had already been taken care of. Vitamin Water & Nike decided to jump their NBA championship promos, rather than waiting for the finals to kick off. This is the NBA, the league that got Ewing to New York and Shaq a 4th ring. Kobe v. LeBron was about as sure a thing as the Clippers drafting Blake Griffin this June. We're going to get to see this. Aren't we? Not so fast . . . .
(1) The Lakers depth is a myth. The Laker bench scored just 24 points combined in game 4. Nuggets backup guard, J.R. Smith scored 24 points on his own. That same Laker bench pulled down 16 rebounds as Nuggets backup Chris Anderson pulled down 14 on his own. Not Jordan Farmer, Lamar Odom, or Luke Walton bring close to the energy off the bench as Smith and "Birdman" do. This Laker bench that everyone including myself raved about has already packed it in. If either of these benches is game changing, it's the one that includes the guy with the mohawk and the guard who sparked a series. (2) One team is having fun, the other is just working. Kobe doing work is accurate, judging by his energy level it's wearing him down. While Dahntay Jones and Kenyon Martin are banging around with Pau Gasol and Andrew Bynum, Melo and Chauncey are bringing this band of so-called bad boys together. The Lakers are missing free-throws, Kobe is forced to play 35+ minutes every night, and it seems as though the Rockets series took more of a toll on the defending Western Conference champs. The Nuggets each know their role, Kenyon rebounds, Chauncey calls the shots, and Melo closes the show, none of them make it look like "doing work." (3) It's a bad time for this. This is the wrong time to decide that Derek Fisher is getting old and can't lock down the game winner. This is the wrong time to decide Andrew Bynum and Pau aren't tough enough for the games bangers. Of course, this is the wrong time to find out Vujacic and Walton give you nothing off the bench. Kobe has to be scratching his head at the team around him, he sits for two minutes and they give up the ten point lead he just gave them. Can Kobe will this team to The Finals? Can the old Kobe, the one with red in his eyes, score 52 points at will and give the Lakers two more wins? It's a bad time to realize that only that Kobe can get the Lakers to where they need to be. A 3-game series with two being in L.A., somehow the Nuggets may be in the driver's seat, we'll find out. . . How did we get here? (1) The Magic just aren't afraid of anyone, or anything. A Dwight Howard suspension in series 1, the defending champs in series 2, and the leagues top contender for a title in series 3, nothing fears them. They shoot their three-pointers, no matter how ill advised. Their working with a replacement point guard for their all-star Jameer Nelson who was hurt at mid-season. Dwight Howard is now 1 technical foul away from riding the bench for a game. The Orlando Magic and their coach who gets banged on by everyone nationally are a game away from the NBA Finals. Only them, believed they could do what they've been doing and you've got to show respect for that, or at least try to. 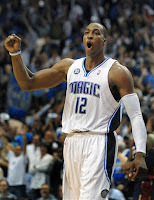 (2) Anderson Varejao and Zydrunas Ilgauskas have no solution for Dwight Howard. Anderson Varejao hanging on his arms and he's still pouring in buckets and ripping down boards. Just like the Celtics without Garnett, the Cavaliers have no one on their roster who can match up with Howard physically. He's changing the way LeBron attacks the basket because no one he's defending can pull him further outside the lane than where he needs to be or wants to be. As a fan of this game, the potential of seeing Dwight Howard against those big bangers in Denver is growing increasingly interesting as you watch it develop this way. If the Cavaliers want back in this series, someone needs to put a body on Howard or he'll continue the dominance he displayed in overtime of game 4. (3) Mickael Pietrus is very good. The Magic guard who was averaging just nine points a game in the regular season has really turned it on in the postseason. Pietrus has scored 10+ points in ten of his last twelve games, including four, 16+ point games. In the game which pushed Cleveland to the brink, Pietrus drilled five three-pointers in 40 minutes. Splitting time with rookie Courtney Lee, Pietrus is turning in a fantastic run. He has picked up the scoring to give Hedo Turkoglu and Rashard Lewis that extra boost in this series. If Cleveland finds a way to stop Howard, they've then got to deal with leaving wide open 3-point shooters, including Pietrus who has been just deadly. If the Magic want to close this out before returning to Orlando, you can't let the Cavaliers get off the mat in game 5. A wise man once said "you going to put a gun on me, you better use it." If th Magic don't put away Cleveland while they can, this series could turn quick. With all that being said, you've got to wonder what we all missed? Was it Stan Van looking more like Ron Jeremy than a championship coach? Did we forget what Carmelo Anthony did in the Olympics and in college? The Nuggets and Magic could meet in the NBA Finals, as basketball fans we should be excited but as casual fans . . .AHHHHHHH!